The first time I camped on the coast, it rained all day. I was in Northern California and hiking through miles of wet trails. When I returned to camp the first night, I was starving. My staple for the trip? Potatoes. Although they can be eaten raw, it’s not the best idea (http://www.livestrong.com/article/523041-the-risks-of-eating-raw-potatoes/). Gather thin, dead material and put it in your pockets, especially yellowed grass. Your body heat and clothing will dry the material. Twist yellowed grass together to make a bundle. This will be your kindle. Also look for piles of pine needles and dry (the driest you can find) opened pine cones under trees or other dead and dry material that may have had some protection from rain. Collect thicker twigs from under trees on the ground or dead low-hanging branches. Punk, which is the dried insides of fallen trees, is also a prime fuel for a wet fire if it isn’t soaked. When you bring back the fire material to camp, try to keep it dry. I put our wood in a bear locker that was in the campground. Storing the material under a dense tree is another option. Never try to start a fire using your tent for protection because the material is usually flammable. To start the fire, light a few dried grass bundles with a match. Gradually add denser material from thin bits of wood and punk to pine cones, and then to thicker twigs and branches. If the twigs and branches won’t light, keep adding grass and smaller bits of wood or dried pine needles. If all you’re getting is smoke, blow on the fire to add some fresh air. Wet material can cause a lot of smoke that might choke a fire. Don’t use paper or other materials that easily soak-up water. If you have logs and kept them dry, add them and continue to add smaller wood until they catch fire. If your logs are wet, expect to spend a lot of time drying them out with a smaller fire before they light. SAFETY TIPS: Avoid at all costs to use gasoline. Gasoline is explosive. 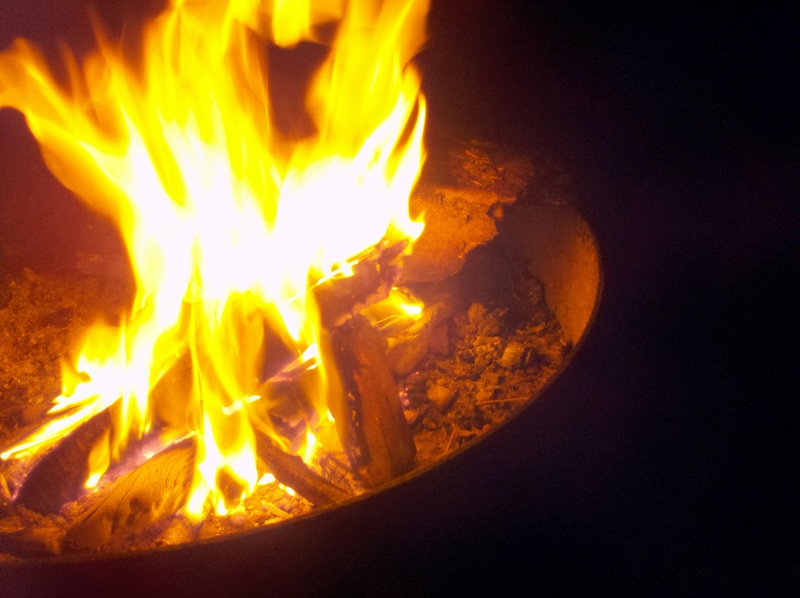 If you get any on yourself when working with a fire, you may erupt into your own personal mobile campfire. Also many ponchos and other water-proof clothes are made of somewhat flammable material. Make sure that what you’re wearing when you work with fire is not going to catch fire. If you have any other tips, feel free to add them in the comments!